Formulation: Liquid. In PBS, pH 7.0, containing 0.09% sodium azide. 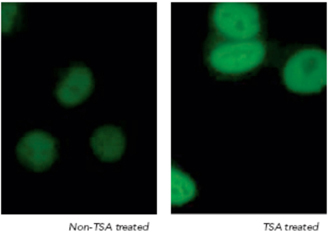 Immunofluorescent analysis of TSA treated (right - 100ng/ml, 24 hours) and non-treated (left) human MMRU melanoma cells using Acetylated Lysine (RS2) pAb. Immunoprecipitation analysis of acetylated BSA with Acetylated Lysine (RS1) pAb in ng.